On a whim I decided to enter a contest for a free entry to the Shoreline Half Marathon from RaceGrader.com (a great place to check for reviews of Southern California races and to find registration discount codes for many popular local races). I’m always looking for someplace new to run and 13 miles along the beach sounded spectacular. Of course as soon as I typed in my email address and hit submit, I had second thoughts. How far exactly is Ventura from my house? Two hours. How early would I need to get up for the race? 4 a.m. Ugh, that seemed a little early for what would basically be a training run for the REVEL Canyon City Marathon in November. But what are the chances I’ll win anyway? Pretty darn good, apparently! So that’s how I found myself lined up at the start of the 2015 Shoreline Half Marathon on Sunday July 12. And what a gorgeous shoreline it was! The half marathon started promptly at 8. I loved how the race director asked people to self-seed in the corral by pace and sent us off in waves every two minutes. It’s an unusual way of doing it but it makes perfect sense to avoid a crowded mass start along the beach path and the chip time doesn’t begin until you cross the starting line. I wore my Garmin Forerunner 10 GPS watch but vowed not to look at it for the entire race. Mike didn’t think I could run “naked” (he knows how I love my data!) but that made me all the more determined! I wanted to practice running by feel and not by the watch. I hoped to go out at a steady pace, slower than marathon or half marathon pace but not exactly an “easy” pace — just a pace I felt I could sustain comfortably for 13.1 miles. I guessed that would be in the low 9-minute mile range. The first part of the course runs five miles north along the bike path and the wide shoulder of the 101 overlooking the ocean. As always in a race I felt grateful for the privilege of being there and being healthy and able to run. The course is nearly all flat with just a few dips here and there, less than 100 feet of elevation change. Around mile 4 I could see the leaders of the race coming back along the course after the turnaround at mile 5. It was fun to cheer them on and marvel at their speed! The north-and-back and south-and-back layout of the course meant that there was plenty of opportunity for people watching with the 664 participants in the half marathon and the people on the boardwalk. Somewhere in the first five miles I passed the 2:00 pacer so I knew my pace was faster than I had originally thought it would be. 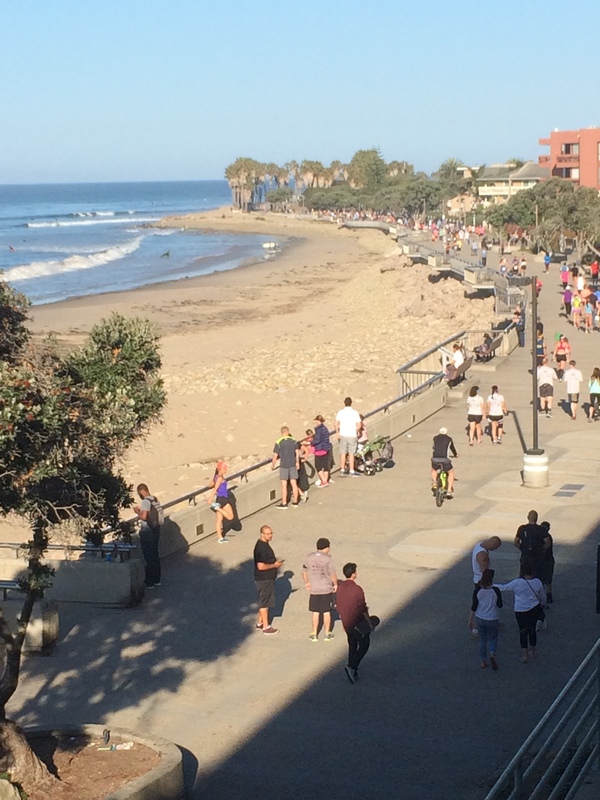 The course then runs the five miles back, past the start/finish line, a couple of miles out under the Ventura Pier and around Ventura State Beach Park, and back to the finish line along the promenade. Around mile 8 the pace stopped feeling comfortable and started getting tougher. The 8 a.m. start time meant that we faced some serious heat on the course in the later miles (73 degrees and humid by the time I finished). I wore a visor and sunglasses and stopped at the aid stations every 1-1.5 miles for Gatorade and water. The volunteers were hustling and did a good job helping the runners. The last 5K of the race was a challenge. My training plan only called for 11 miles for my long run so when I passed the parking structure after mile 12 the temptation to call it good was strong! The plan also called for a “fast finish” though, so I picked it up for mile 13 and brought it home strong. I enjoyed the bananas, oranges and Gatorade at the finish line while I waited in line for the free tacos. There was free beer too but I wouldn’t have survived the drive home with that! It was an interesting experience running the race “naked.” I ended up running faster than I would have had I been looking at my watch, and yet the pace felt easier. I found that when I run by effort, the pace feels more comfortable than if I try to “force” myself to hit a certain pace on the watch. Now would I pace a marathon goal race this way? Not likely. That would take a lot more practice for me and a lot better sense of how to run 26.2 by feel. Would I pace another half this way? Absolutely, especially if I wanted to use the race to gauge my current level of fitness. For not tapering (and for spending several hours the previous day cleaning and priming my daughter’s bedroom to paint), I was very happy with how the race went. I recommend the course for the views, the smaller size of the field, the ease of parking and same-day packet pick-up, the nice race t-shirt, finisher’s medal, and free tacos and beer at the finish. Just a few tips if you plan on going for a goal time on this course: place yourself toward the front of your wave at the start, be prepared to dodge a few runners and people on the boardwalk (which isn’t closed to the public), and dress for the heat. With early bird registration starting at $45 for the half and going up to $75 in the months before race day, it’s a great value for a well-run (no pun intended), gorgeous race! Have you ever run a race “naked”? Do you find it easier to run by feel or by a GPS watch?